Growing concern in Israel that Trump could include 'East J'lem' as capital of Palestinian state in peace proposal. 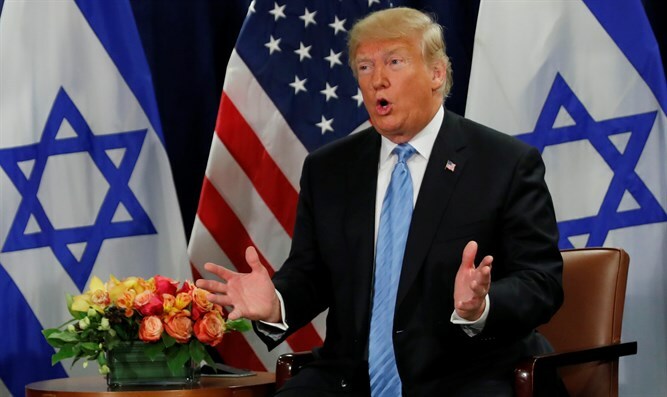 A senior Israeli political source estimates to a Yediot Aharonot reporter that if the results of the midterm elections in the US lead to a weakening of the Republicans, the pressure on US President Donald Trump to reach a political settlement between Israel and the PA will increase. The Israeli concern, he says, includes the possibility that Jerusalem will be included in the American political proposal. This could mean defining “East Jerusalem” as the capital of a future Palestinian state parallel to the recognition already given to “West Jerusalem” as the capital of Israel. "Trump wants a deal and he's very serious," says the source. "As far as the Americans are concerned, the Israeli-Palestinian conflict is relatively easy to solve and is ‘ripe fruit.’"
Netanyahu would not be able to agree to such a plan which includes Jerusalem, so he would likely seek to postpone publication until after the elections in Israel, so that the matter doesn’t lead to a coalition crisis with his government partners. The Israeli goal is to leave the PA and Abbas in the position of the refuser, since Trump is expected to exert most of the pressure on the party which rejects his proposal. According to Yediot Aharonot, the US ambassador to Israel, David Friedman, and other officials will work with the American president to prevent the publication of a plan that includes the inclusion of Jerusalem in the proposed political settlement.